Before there were A Few Great Women, there was a blog about my experiences developing an in-house prospect research and relationship management shop at a community foundation. It was lonely on my own, so blogging helped introduce me to the smart and sweet #prospectresearch and #prospectdevelopment communities around our planet. 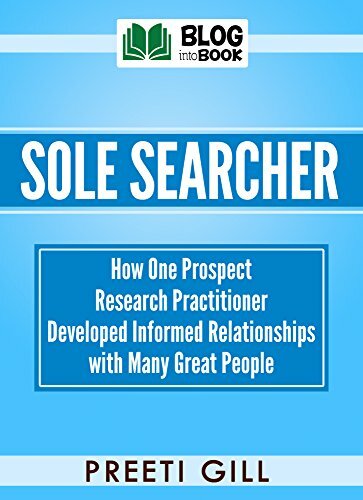 I retired the Sole Searcher blog in 2015, but not before compiling some of the most popular posts into an e-book you’ll find on Amazon (for an incredibly reasonable price, I may add).